The popularity of Beatrix Potter’s books continues after well over a century. 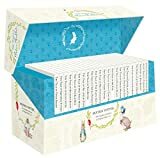 A complete box set of twenty three Peter Rabbit titles will make a special gift for a child – and also for many parents who would have loved to own one themselves years ago. The trouble is, they’re so expensive. But are they? Really? 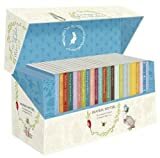 Click through on either of the images below and see some of the amazingly affordable prices at which these Beatrix Potter book sets can be obtained at present. The box set above was published in 2006 by Warne, Beatrix Potter’s original publisher, and is still available. The set illustrated below was republished in 2011 to mark the 110th anniversary of Peter Rabbit. See also our main Beatrix Potter Gifts page for a wide range of Beatrix Potter gift choices to please both children and adults alike.